In this Part II of my translation of the second chapter of Lu Yu’s Classic of Tea (Cha Jing 茶经) eight further pieces of essential ancient tea-making equipment are described. Here we see ancient Chinese people have started to standardize product measurements so that buyers and sellers do not really need to weigh or count the tea cakes. We also learn about the simple ways in which the tea cakes are dried and kept dry using very primitive materials. 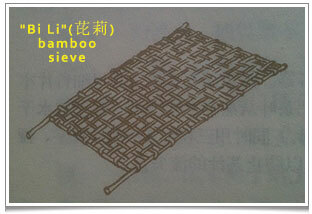 First, there is a kind of sieve called “bi li” (芘莉). It was made from 2 bamboo poles 3 “chi” (尺) i.e. 1meter in length with a handle of 5 “cun” (寸) or 17cm. Its bamboo weave, 2 chi wide, had square holes allowing the tea leaves to dry. 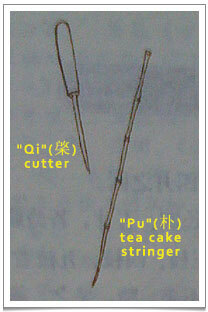 Next, a “qi” (棨) or a small cutter with a wooden handle, used to poke a hole in compressed tea cakes. 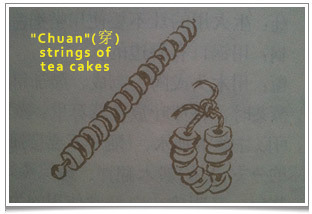 The “pu” (扑) or “bian” (鞭) comprised strips of bamboo which acted as a “string” holding several compressed tea cakes through the holes made with the qi. “Pei” (焙) was essentially an underground fire pit for firing tea leaves. It was 2 chi deep, 2 chi + 5 cun wide and 1 “zhang” (丈) i.e. 333cm long. Surrounding the pit was a low wall 2 chi in height. The whole construction was made from clay. The next two items are used on the pei. 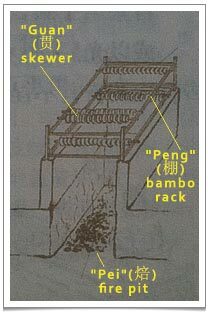 They are skewers called “guan” (贯) and wooden shelves called “peng” (棚). Tea cakes (with a hole in the middle) to be fried and dried were skewered on the 2 chi and 5 cun-long guan which are then placed on the peng shelving over the pei pit. The peng had two shelves 1 chi apart: the tea would start on the lower one and then be moved up for final drying. 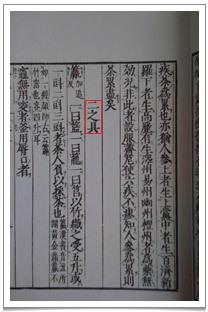 “Chuan” (穿) was a string-like material used as a unit of measurement. Its meaning varied from region to region. In parts of Anhui province, such as the Huainan region or east of the River Chiang Jiang, where chuan was made out of bamboo strips, “shang chuan” (上穿) equated to 500g (or 1 “jin” (斤)), “zhong chuan” (中穿) equated to 250g and “xiao chuan” (小穿) equated to 120-150g (a.k.a. 4-5 “liang” (两), 1 liang being 30g). However, in the Basu area of Yunnan, where chuan was made from the bark of the mulberry tree, the corresponding meanings were 60kg (1 shang chuan or 120 jin), 40kg and 25kg. So you had to be very careful buying and selling tea in Lu Yu’s time! 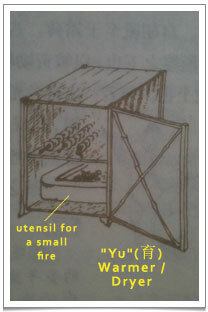 Finally, the “yu” (育 meaning ‘cultivating’) was a wooden warming cupboard with bamboo shelving, a little door and paper glued on to its sides. The bottom of the yu held a utensil for a small flame. People who lived south of the River Chang Jiang would store their tea in the yu during rainy seasons to keep their tea dry. 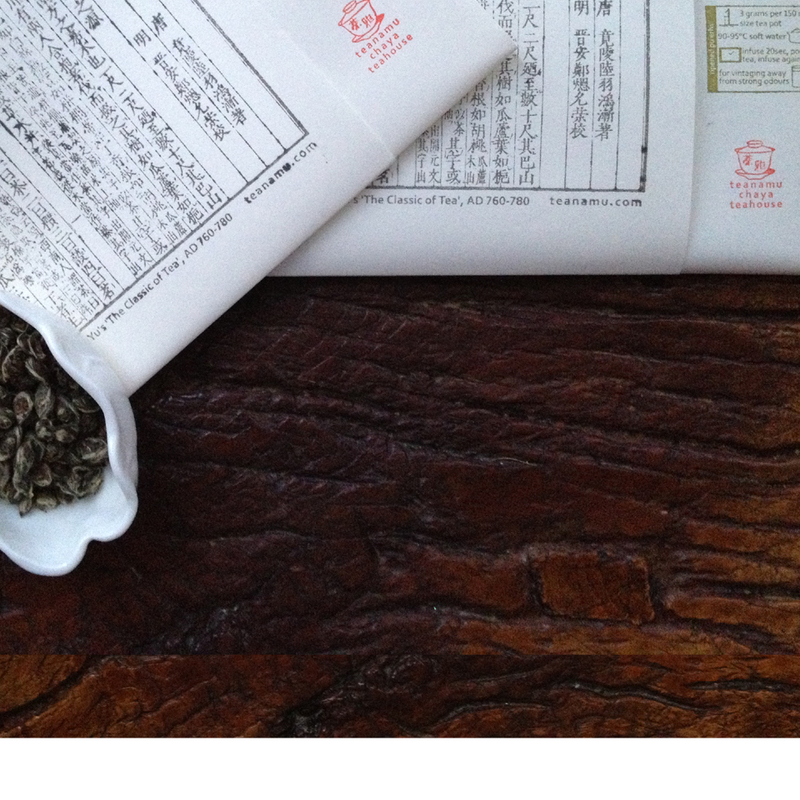 Imagine what a fragrant house it would be if one had a yu constantly drying tea leaves. Wouldn’t that be very calm and meditative! I had a fun time trying to find descriptive information and pictures of the 16 ancient pieces of tea making equipment in these two blog posts! So now moving on to Chapter 3! A bamboo sieve used for drying tea leaves. A strip of bamboo or bark of the mulberry tree used to string together tea bricks. Each string of teas has a specific weight which may be different in various tea producing areas. An underground fire pit for firing tea cakes. The tea cakes are string in skewers resting on a bamboo rack. A cutter and a bamboo strip that are used to create a hole in the tea cakes so as to string together. A warmer contraption that is useful in rainy seasons as tea bricks will need to be kept dry.